Kulachi Hansraj Model School, Delhi, India is celebrating "Pragyalok" the world of light and light of wisdom an event to commemorate International Year of Light and light based technologies & International Year of Soils, healthy soils for healthy life on 10th October, 2015. Science exhibition was conducted in the Senior wing. 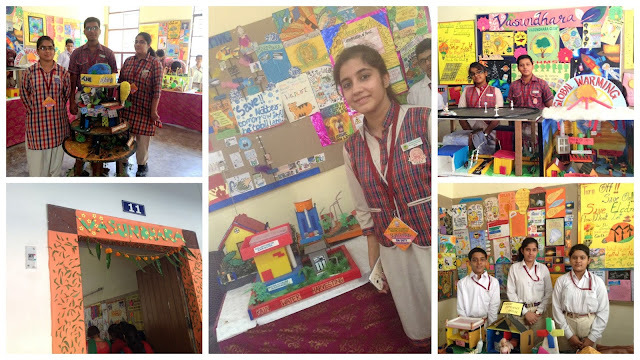 Students put up an array of exhibits at the exhibition. Eco-Club also participated in the exhibition. 25 exhibits were displayed in the room allotted to us. 1. 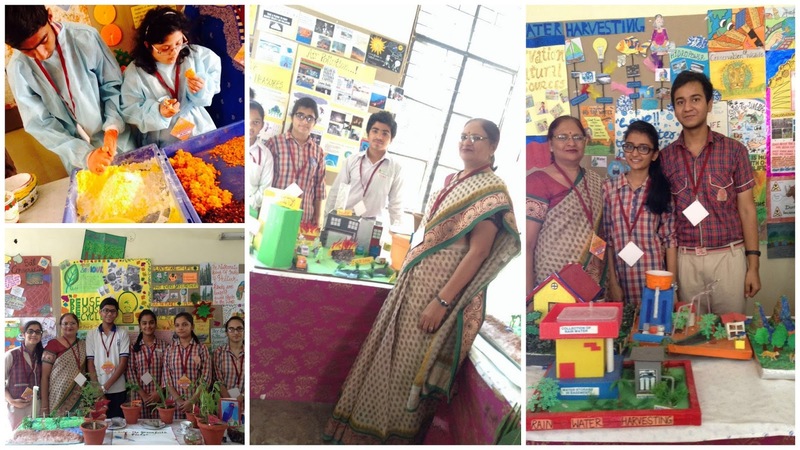 Students used various innovative measures to make useful items from the waste materials. They used old pens, bottles, newspaper CD’s bangles to make beautiful pen stand, paper bags, jewellery boxes, clock, decorative items etc. 2. Sparrows were very common to see but surprisinglynow their number has reduced. 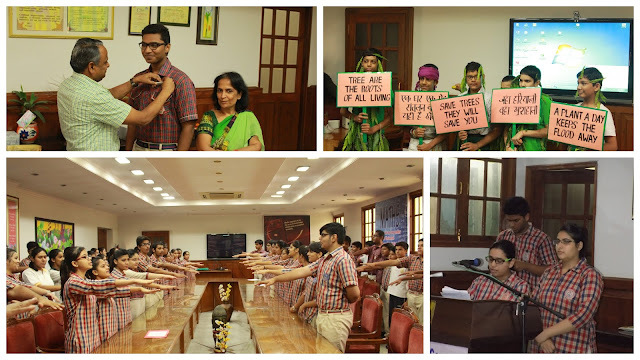 So students were encouraged to draw sparrows so that they could stay in touch with the beauty of nature. 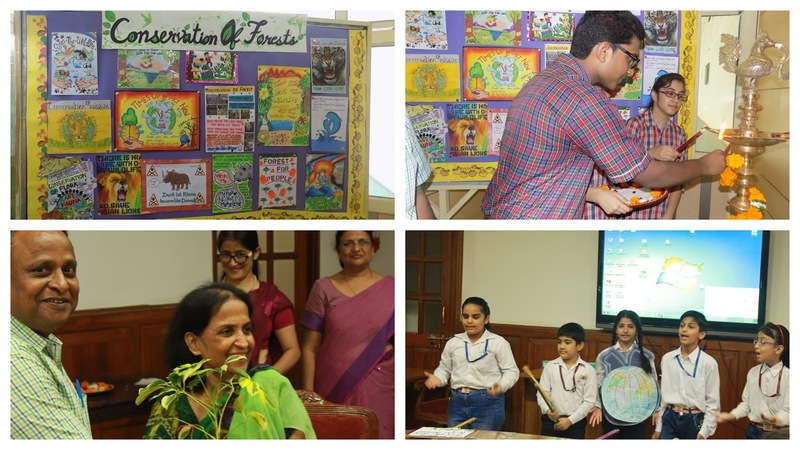 They also prepared nest of various birds and display their features, eating habits ways of communication and the importance of birds in human life and the measures which we need to take to conserve them. 3. Let Delhi Breath Students of class IX prepared a model depicting ways of emitting effluents their harmful effects and how to reduce it? 4. An eco-friendly holi colours made from natural biodegradable material by the students of our school. They collected waste flowers from temples students are trained to cut petals of the marigold and rose flowers which are dried at the room temperature, measured and packed in air tight containers, grind these dry petals and convert them into herbal holicolours students after working into whole year round, make beautiful and vibrant herbal holicolours, which are their packed and sold. This year students sold 1000 packets (100 gm.) each of herbal holicolours. 6. Herbal Garden Plants like Neem, Tulsi, Amla, Bahera, Alovera Kari patta were grown in pots. Student’s depicted their medicinal values on the board prepared by them. 7. Alternative sources of energy Model was focussed on use of solar energy. Solar energy is an efficient way to heat materials with the help of solar panels, batteries and the right equipment. We can use solar water heaters, solar cookers and solar powered bulbs. It can also be used to generate electricity in both small and large amounts. The earth has music for those who listen. 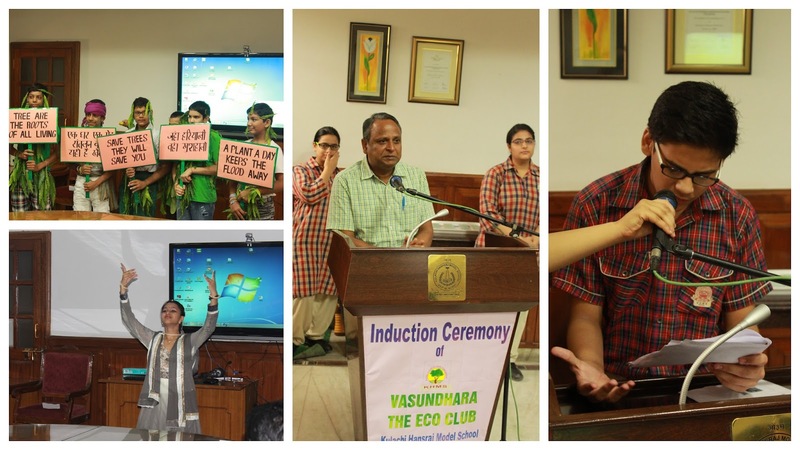 To nurture our nature we formed ‘Vasundhara’- the eco club of our school It’s 10th induction ceremony took place on 30th August,2015. Dr. B.C.Sabata, senior scientific officer from Department of Environment, Govt. of NCT Delhi was the chief guest of the occasion. He, along with the principal of the school, Mrs. SnehVerma lighted the lamp of knowledge and was greeted with a sapling with a hope for a better tomorrow. The ceremony began with annual report presented by outgoing president, Ojaswai Jain and Priyank. The programme was carried forward by marvellous classical dance performance, a sweet song with glints of hope for future, ‘ paryavaran- pradushan se jug ko bachaye hum’ and a power point presentation on Let Delhi Breathe presented by Vishrut Mahi of class IX. Our respected principal Mrs. SnehVerma and chief guest Dr. B.C.Sabata addressed the gathering with their inspiring and motivational words that kindled a ray of determination in all of us. It was decided that the agenda for the following year would be keep our surroundings neat and clean.